So today Willow is much brighter than yesterday. She is still laying down a lot, but I think she just needs to get off her feet and rest. She is eating better (still not enough), and she just seems more alert and in less pain. So the plan is for Willow to receive all her meds (except the EPM, probiotics, oils, supplements, etc.) through injection as to not ruin her appetite. So far, it seems to be helping... we'll see. In any case, she is just so much better, and I truly appreciate all of the kind words, support, love prayers. 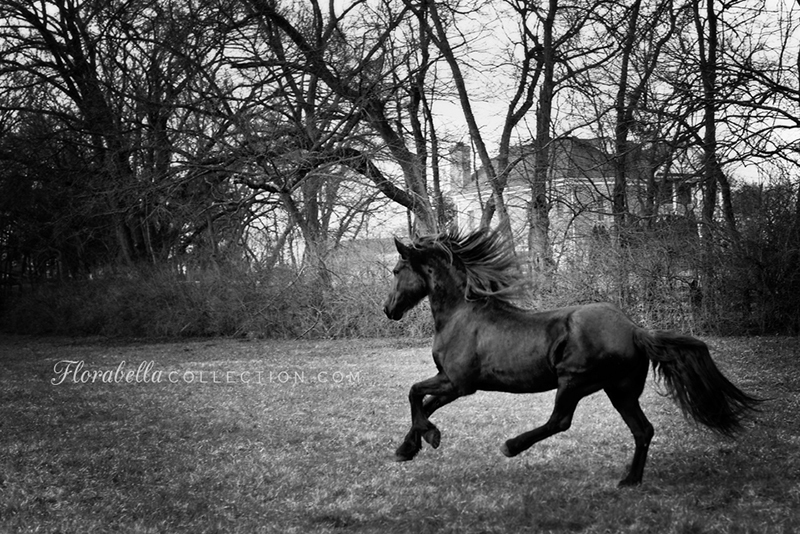 I just know that Willow is a very special horse... not because she's a Friesian or a rescue... and not because she is drop dead gorgeous (because she is)... :) But I just know there is a greater purpose for her.... her life and struggles and our journey together. I'm not one to believe in fate or destiny, yet this journey seems somehow that it was meant to be. The question remains, though... why? I believe animals are put on this earth for such a short time to teach us profound lessons. Thru you Willow is teaching us all. Thank you so much for sharing your beautiful journey with us.BUT...while she is struggling will you PLEASE update a bit more just to let us know you guys are OK! :D Soooo glad she is doing better!!! I am so happy to hear she is doing better! I saw a bumper sticker on a car the other day...it was in the shape of a paw but read "Who rescued who?" Glad today was better for her. So glad to hear she is doing better. Staying off her feet, eating better, more alert...we'll take it. She must get better each day. God brought you on this earth to love and care for those who need a good and loving home. God Bless you Shana. It took me Willow to get me to your blog...not your templates, filters...beautiful as they are. LOL I'll be keeping Willow in my prayers...most especially. But - if we speak positive words - they will come true! I feel and believe Willow is going to get better once again. She has a tremendous support team behind her and so many people who are following your blog who are rooting for her too! Speak positive words - don't let those worries creep in. So glad she is feeling better!!! Been looking for updates all day!! Saying prayers and more prayers for that sweet girl!!! I am so glad to hear that Willow is doing better. I was so afraid to open your blog tonight for fear that she had not improved. I have been following your blogs for many years. You have a heart of gold and I am sure one day you will know the answer to the question Why? Willow has so many people praying for her, I just know in my heart she will be ok. I'm happy to read this :) Recovery sure does have it's ups and downs. I hope Willow has more up days! I was thinking about Gypsy Prince the other day when I was at my barn. I felt like when I saw his photo a name was on the tip of my tongue. It finally came to me. Nicholas. Not sure why. But Prince Nicholas :) Nicky when he's goofy. I can't wait to hear what you choose! It makes my heart happy that Willow is better today! I've been waiting and looking forward to an update in hopes there would be good news...YAY! There will almost always be a "Why" and we may not know the answer in this life, but one day, it will become clear. Give Willow hugs, kisses and candy from all of us! So glad you updated, I was very concerned. Thrilled to know she is doing better. I've been checking for updates and feel so much better after this one! Soooo glad to hear Willow had a better day. PTL. I will continue to keep you all in my prayers! Wonderful news, it is good to hear that Willow is doing better. I pray she continues to improve with each day. As far as why, that is the million dollar question isn't it. Why was Willow mistreated in the first place, why did she end up in your care, and why does she have to continue to overcome difficulties. We may never know the answer to "why", but we can trust God to guide us through all of the triumphs and difficult hours. Maybe, we don't know so we have to lean on and trust God. Keep the faith and know that in every circumstance, God is with you!! So, so relieved that Willow has improved! Hope this is the first day of only good things. Quote "I have to tell you Shana rescuing horses seems much like foster parenting in that you are getting them when they most likely have been mistreaten, unloved, and at the last stage in their life before someone comes along loves them and helps them along. Much like God does with us." I wanted to write something encouraging then saw this comment from Lisa above here and she said it so well. Sometimes we were are tired and afraid we need support likes this. Doesn't mean we are weak just tired and afraid. Be encouraged, only God knows the final outcome but you are doing your best. Whether it is an animal or caring for a sick loved one, do your best and pray for healing, and for strength. Remember you may go through this so down the road you have more understanding for the next one hurting. What if your pain helps you understand that hurting friend like no one else can. I think it is good that we talk to each other about our fears and discouragement so they know how to pray for us. I will be praying for you and Willow. Thank you for letting us be a part of both of your's life. I have been so afraid to click on Willow's page link after you posted the photo of her laying down, and telling us about the look in her eyes....I literaly let out a sigh of relief when I read your latest post this morning. As everyone else is, I'm so glad to hear that the injections seemed to have helped with her appetite. You both have such a following now, and you can add the Gypsy Prince to the parade too! It's been such a story of hope and life to live along with you! Thank you for sharing it with us! Thank you for the update - it makes me so happy to hear that today is better than yesterday. feeling much relieved hearing that she is doing better and not worse. Queens are strong and proud. Let's wait. Thanks for keeping us updated on Willow's journey. You are the best Shana. Willow is blessed to have you in her life and I know you feel the same way about her. I'm afraid every day to click on your blog for fear you will have worse news. So many of us are praying for her and all of you who are so lovingly caring for her. I hope she continues to grow stronger and can be well by summer. Good luck and God Bless all of you. Shana, Praying for you tonight. Hugs and Love to you and all who love Willow. This picture is just beautiful. She is running around Heaven tonight being the Qween that she is. You will see her again and you will get to ride her like you wanted to in the spring. Hugs and thank you so much for sharing her with us. It is truly a wonderful gift you gave us.